Hello everyone. Myself Aman Kumar Sinha, a student in IIT Kharagpur. I am writing this post for those IIT aspirants who didn’t qualify KVPY this year and got demotivated and want motivation so that their preparation for IIT won’t be disturbed. 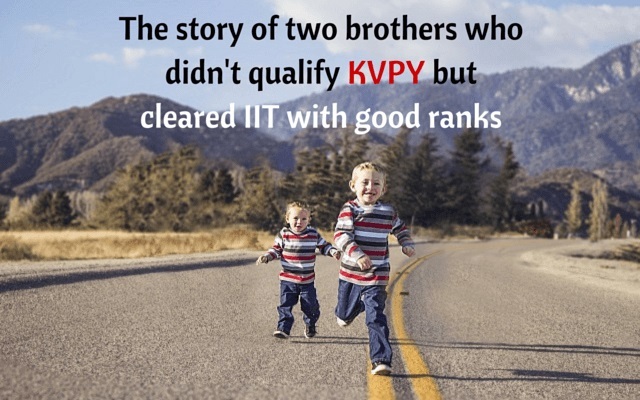 Okay I’m going to tell you about the two brothers who didn’t qualify KVPY but cleared IIT with good ranks. First story is about the student who is elder among them. He gave KVPY in class 12 but missed to qualify by 0.5 marks because of silly mistakes done by him. He cried so much after knowing that he is not going to qualify KVPY. He had taken almost 1 week to become normal and to be focused on his study. He knew he has the capabilities to qualify KVPY, Olympiads and IIT. Apart from KVPY he qualified all the exams he had given. And you know he did it in IIT and ranked AIR 2899. And now story of his younger brother. He also gave KVPY in class 12. He just wanted to clear KVPY for his elder brother. But unfortunately he also didn’t qualify by 5 marks. He was not even sad because his elder brother is so much supportive. But after that he promised his brother that he will qualify IIT with under 500 rank. And you know he also did it and qualified IIT with amazing rank of AIR 193. These two brothers are me and my elder brother. The main reason behind my success is my elder brother and my family. So be focused on your study, automatically you will get the success. Aman Kumar Sinha is an ECE student at IIT Kharagpur. A Python programmer, having a keen interest in in the field of technology, he is part of a robotics club of IIT Kharagpur.